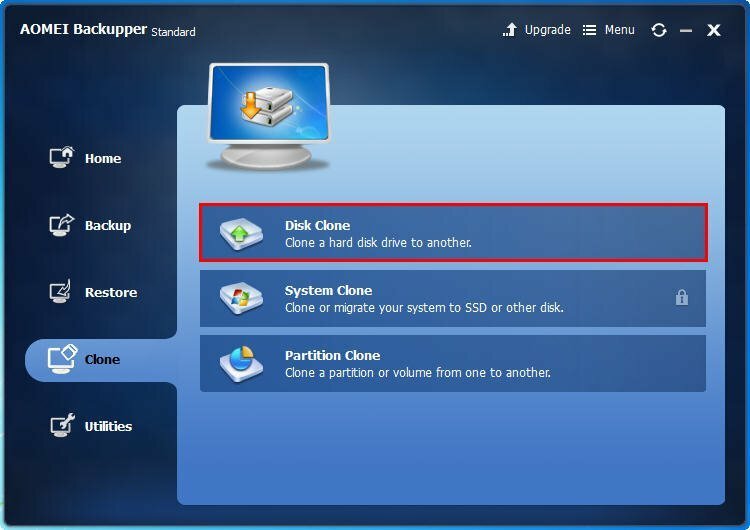 Intel SSD data migration software will help you clone HDD to Intel SSD easily. AOMEI Backupper is one of data migration for Intel SSD that can migrate data safely and simply. Intel SSD has many series for users, such as Intel SSD DC P3608 Series, Intel SSD DC S 3510 Series, Intel SSD 750 Series, Intel SSD 535 Series, etc. Intel SSDs are famous in the world. It has very good properties and very good after-sale service. What’s the important is that it has a long warranty period that guarantee to keep their products in good repair for 5 years. Thus, many users would like to use Intel SSD. Users know that the SSD has better performance than HDD. If you would like to change your old hard drive to Intel SSD and keep the old data meanwhile, migrate data from your old hard drive to the new Intel SSD is a good idea. You can take your old data and save the time for reinstalling the system and applications. How to migrate data from old hard drive to the Intel SSD? To migrate data to Intel SSD, here we highly recommend you a third party software AOMEI Backupper, which can help you migrate every data from you old HDD to the new Intel SSD and improve its performance at the same time no matter Windows 10 or Windows 8/7/XP/Vista you are using. it supports all Windows operating system, both 32 bit and 64 bit. For PC users, AOMEI Backupper provides you a free edition named AOMEI Backupper Standard, which you can use to migrate data to Intel SSD without payment. Before you do, you need prepare something for it. ● An Intel SSD. It could be smaller than the hard drive. AOMEI Backupper provides you migrate data from HDD to a smaller SSD. But it must be as large as the data volume. ● A computer with your old HDD. ● Download this freeware, install it. After preparing, you can migrate data from HDD to SSD by following those steps. Step1. Plug in the Intel SSD. It may not display in My Computer because it is a brand new SSD without formatting, but it can be detected by the AOMEI Backupper. Launch the progress. To migrate data from HDD to SSD, here you can clone the hard drive to your Intel SSD. Click Clone->Disk Clone. Step2. Then, it will lead you to select a source disk. Here you need click the original disk in your computer as the source disk. Step3. After selecting the source disk, you should select your Intel SSD as the destination disk. Click it. Step4. This software will give you a page to ensure the operation you did. Here contains another functions. For example, you can click the setting icon to edit the partition size for the destination disk, so that you can use it directly as soon as the progress finished. If you want to make sure that the Intel SSD would be in the best statement, just tick the box in front of “Align partition to optimize for SSD”, it will improve the performance of the SSD automatically after cloning. Tips: The “Sector by sector clone” would take every bytes on the old hard drive. If you want to clone hard drive to Intel SSD sector by sector, your Intel SSD must as large as the old hard drive at least. This operation would take a longer time and lager space. AOMEI Backupper is a good Intel SSD data migration software, it can not only migrate data from HDD to your Intel SSD, but also can do many others to make data safe. Such as creating bootable media, backing up files automatically, etc. It has a good reputation among users because of its powerful functions and free.